Providing commissioning services for the Commons renovation and conducting a retrocommissioning qualification study for the CAPA Symposium. Providing consulting services during the implementation and administration of the Burlington 2030 District. Conducting a qualification phase re-commissioning study for Main Street Landing in Burlington, VT.
Retrocommissioning analysis of HVAC systems at the Burton Snowboards Burlington, VT facilities. Consultation for the ongoing renovation project at Burton Snowboard's headquarters. Conducting level II energy audits for the City of Montpelier City Hall, Fire Station, Police Station, Department of Public Works Office and Garage, Water Resource Recovery Facility Office, and Water Treatment Plant. The goal of these audits is to identify electrical and thermal energy savings that will help the city reach its Net Zero goal by 2030. Providing engineering services in support of HVAC upgrades at the Police Station. Providing energy efficiency and demand management services for ConEd, which powers New York City and Westchester. The project includes measurement and verification of energy savings as well as process and impact evaluation of energy programs. Commissioning the Mary Hitchcock Memorial Hospital Center for Palliative & Hospice Care and the Dartmouth Hitchcock Medical Center Off Site Data Center, both of which are located in Lebanon, NH. Providing commissioning services from the design phase through the post-occupancy phase at Sykes Mountain Avenue in Hartford, VT.
Commissioning agent for One Taylor Street, a 30-unit multifamily building located in Montpelier, VT that must meet the High Performance Track of the Efficiency Vermont Multifamily Energy Standards for new construction. Continuing engineering support on demand lighting limiting controls for this non-profit community organization. Commissioning new AHUs, retrofit planning, and consulting on building controls. Based on our previous qualification study, we are currently developing a retrocommissioning study, which will consist of a Building Automation System investigation and solidifying a project scope. Commissioning the new Squash Center, Field House, and renovated Bread Loaf Inn. Retrocommissioning scoping study for National Life's headquarters in Montpelier, VT.
Commissioning a chiller replacement at this St. Albans, VT hospital. Commissioning the new City Market South End in Burlington, VT.
Commissioning for various Vermont Air and Vermont Army National Guard facilities. Commissioning the new Spruce Peak Adventure Center in Stowe, VT. Conducting state-wide energy audits and energy analysis of HVAC, lighting, and plumbing systems within state office buildings. Commissioning the new Alumni House as well as the renovations and additions in Kalkin Hall. Cx Associates provides commissioning, retro-commissioning, and problem-solving for several projects at UVMMC. Current projects include assisting with their chiller plant modernization and conducting BMS upgrades. 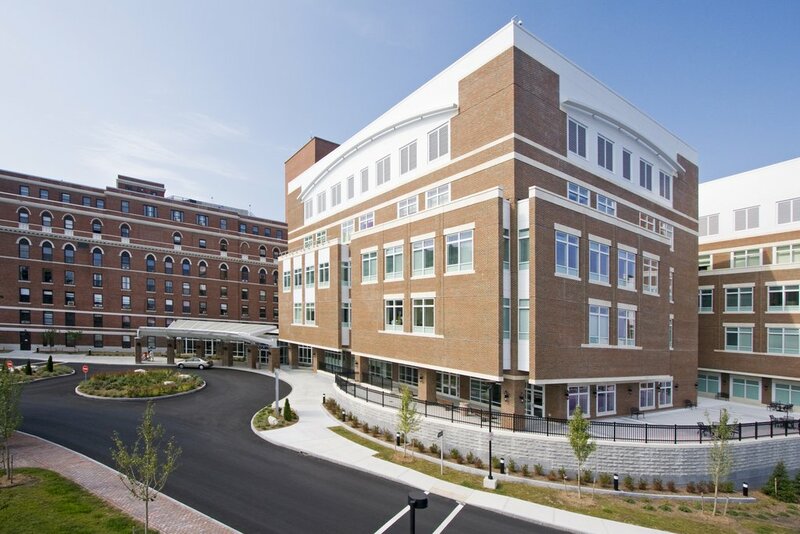 We are also currently commissioning the Fanny Allen Urgent Care building, renovations in the McClure building, and the new $187.7 million Miller Inpatient Building. Retrocommissioning the Vermont Historical Society, Chittenden East Supervisory Union school buildings, Freedom Foods, King Arthur Flour, and Vermont Technical College's Campus Center and SHAPE Fitness facility. Providing energy analysis, commissioning, and measurement and verification related services for the new South Burlington Community Center project.